Lyophilized wild rose juice 80% (±5%), micronized apple fiber 20% (±5%), cellulose capsule shell. Use two (2) capsules per day, preferably before a meal. Natural source of vitamin C, pro-vitamin A, easily digestible, recommended in pro-health prophylaxis. Supports protection against oxidative stress by neutralizing free radicals harmful to the body. Helps in maintaining correct functioning of the circulatory system. It positively influences the reduction of "bad cholesterol" due to the content of gallic acid, while supporting the circulatory system. is rich in natural fruity vitamin C, originating entirely from pressed fruits – 100 ml of juice contains as many as 450 mg. Because of the content of other naturally occurring substances, such as beta-carotene and bioflavonoids, the fruity vitamin C is many times better absorbed than in the case of synthetic vitamin C. Vitamin C, lycopene and bioflavonoids exhibit a strong antioxidant effect – they protect the cells from oxidative stress by neutralizing free oxygen radicals which are especially hazardous for the organism. By consuming products rich in these elements, you support your immune system, slow down ageing processes and improve the functioning of your circulatory system. Among about 1400 species of rose, there are 23 growing wild in Poland. The varieties of wild rose differ in flower colour (from pale pink to amaranth) as well as in shape and colour of fruits (purple red or coral, spherical or oval-elongated). It is the flowers and fruits of the wild rose which, because of the abundance of substances contained therein, constitute herb material. 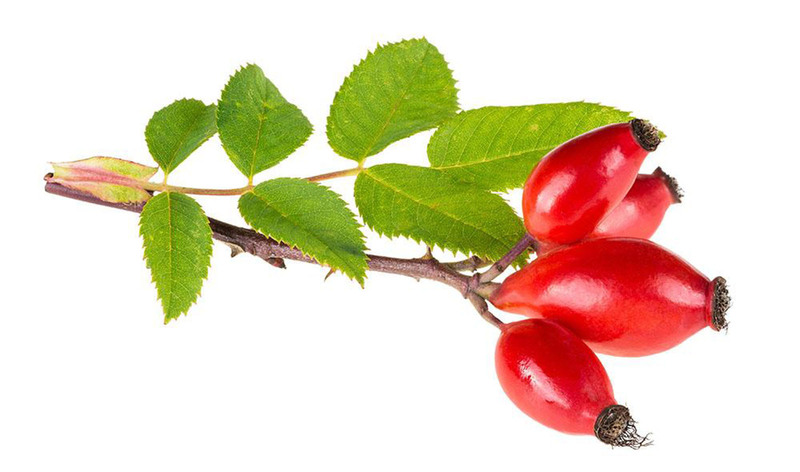 The wild rose fruits have record-high content of vitamin C – it is 30-40 times higher than in citrus fruits. They also contain a variety of different vitamins – A, B1, B2, E, K, as well as folic acid, carotenoids, flavonoids, organic acids, tannins, pectins. They are used in treating high blood pressure, heart and liver diseases, and as a vitamin medicine. They have a reinforcing and anti-inflammatory effect, they help in treating gastrointestinal tract diseases and protect from scurvy. What is more, the flowers – thanks to a large quantity if flavonoids, anthocyanins, tannins and essential oil – are mainly used in treating indigestion, sore throat and skin problems. Infusion from rose petals can be used to clean the face to refresh the complexion. 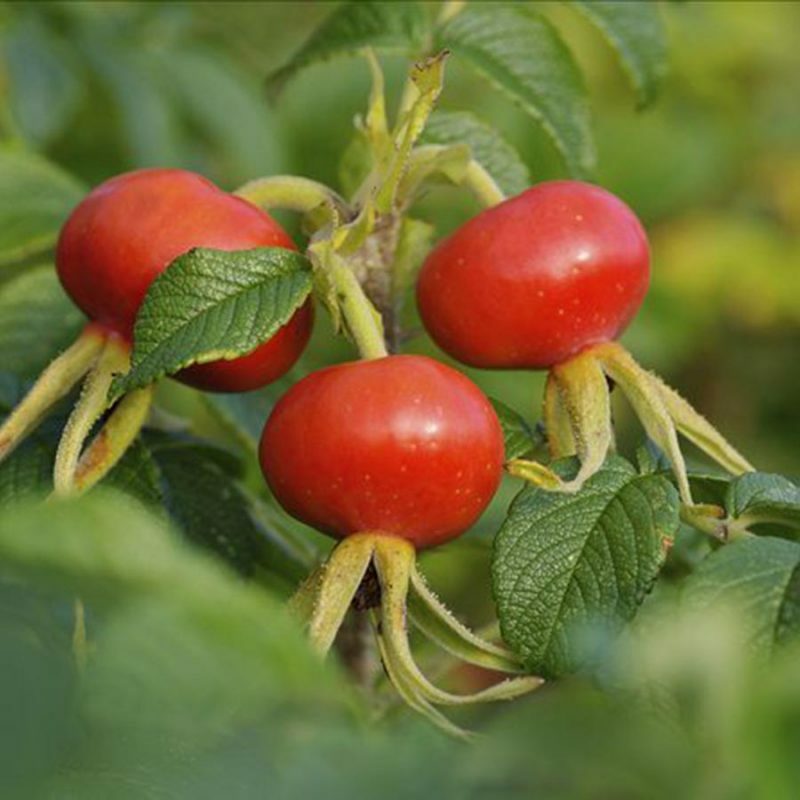 The wild rose fruits are valued for their high content of vitamin C. 100 g of fruits contain about 500-700 mg of the vitamin. Its content in raw fruits is several dozen times higher than in the case of citrus fruits. Drying, freezing and boiling it causes the quantity of vitamin C to lower significantly, but it still remains several times higher than in the case of citrus fruits. 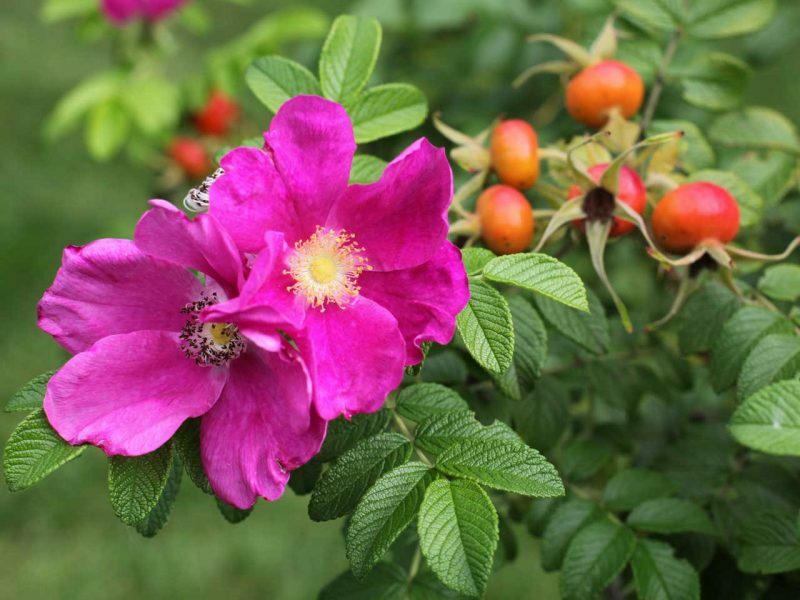 One to three wild rose fruits cover the recommended daily intake of vitamin C for an adult. Wild rose fruits, used for healing purposes, are picked in August and September, when they are ripe, soft and juicy. Supports the immunological system, that’s why it is used in treating cold and during pregnancy, and as a preventive measure. Supports the treatment of sore throat. Protects the circulatory system and strengthens blood vessels. Relieves the symptoms of rheumatism. Relieves the symptoms of respiratory diseases. Reduces the feeling of tiredness. Relieves the symptoms of diarrhoea and indigestion. Supports the combat with urinary tracts.